Creative people interested in expressing themselves. Fashion students, designers, stylists, artists, musicians, shoe lovers and more are welcome to apply. Entrepreneurs and marketing people wanting to start or expand their businesses. Independent brands looking to introduce a custom shoes line within their existing brand. Design amazing shoes down to the last detail. Choose and customize from more than 70 bases, including women’s fashion, men’s classic, and unisex sneakers and sports styles. Pick from an extensive palette of colors and materials. Add your own logos to the designs. Create your own unique packaging. Launch your campaign and reach seven pre-order sales to start production of your designer shoe. Sell and offer promotions with ease through your custom e-shop. Earn $30 profit on each pair of custom shoes sold. 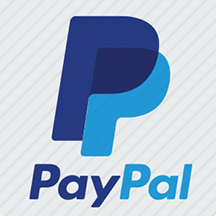 Transfer profits to your PayPal account. Your custom shoes are made in Italy and shipped directly to your customers in less then 15 business days. Never think about production, shipping or customer service; we’ve got your custom shoes and customers covered. 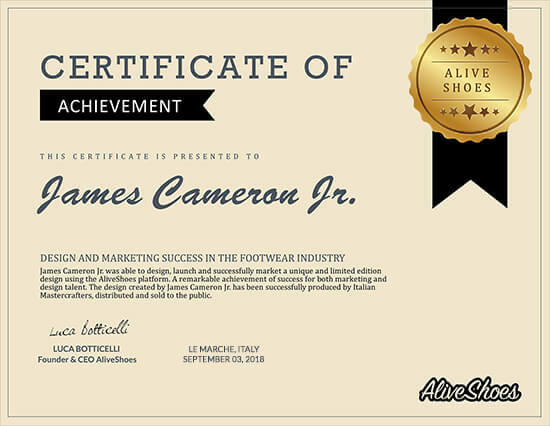 Once your first seven custom made shoes are sold, you can redeem your AliveShoes Official Designer Certificate to use on your CV or résumé. Access additional design features and exclusive options for a small fee to expand your custom shoe design possibilities even further. Access five unique and highly exclusive sneaker soles, such as gold, silver, marble, recycled, camo and fluo. Access 10 limited edition materials and patterns, such as faux crocodile print, premium denim, camouflage, vintage textiles, leopard print and more. Access a wide selection of cruelty free vegan and eco leathers in multiple colors and start creating completely eco-friendly and vegan designs. Access seven premium shoe models that include special technical constructions, trendy bases and signature designs. Make the shoes entirely yours, removing all AliveShoes logos and images from the insole, the packaging and invoices. Jump to the front of the production lines. Get your custom shoes made even faster, shipping directly to customers in 6 to 12 business days—half the time of regular production. Lock your design combination and name for a small additional fee so that your shoe becomes an official Limited Edition, and can't be recreated by anyone else. Reach initial sales goals to access free premium services to help boost your designer shoes brand to a whole new level. Reach 10 custom shoes sales to join our top publicity network for a huge boost in visibility. Get your story featured in magazines and international press. Build relationships with bloggers and social influencers. Reach 50 total sales with your custom shoes and access our elite shoe development network in Italy for a boost in branding, design and marketing. Develop an entire capsule collection based on your sketches and ideas. Create a completely independent and stunning e-commerce presence separate from aliveshoes.com. Further develop your line's branding, image and photography, and showcase to our international partners. Start making and selling awesome shoe designs.